Mack-Cali Realty Corp. has unveiled new renderings of its planned $75 million redevelopment of the Harborside complex in Jersey City, where it’s slated to modernize more than 4 million square feet of office space and create a new public retail plaza. 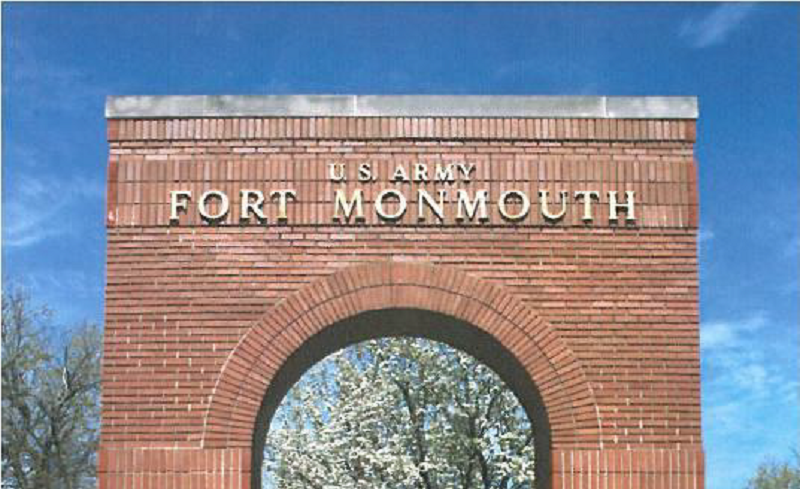 The real estate investment trust has tapped SJP Properties to serve as project development manager in the initiative. SJP will oversee what Mack-Cali describes as an ambitious architectural overhaul, which was designed by Elkus Manfredi Architects and is part of the company’s effort to focus on its portfolio along the Hudson waterfront and in other transit-centric or high-performing submarkets in the state. 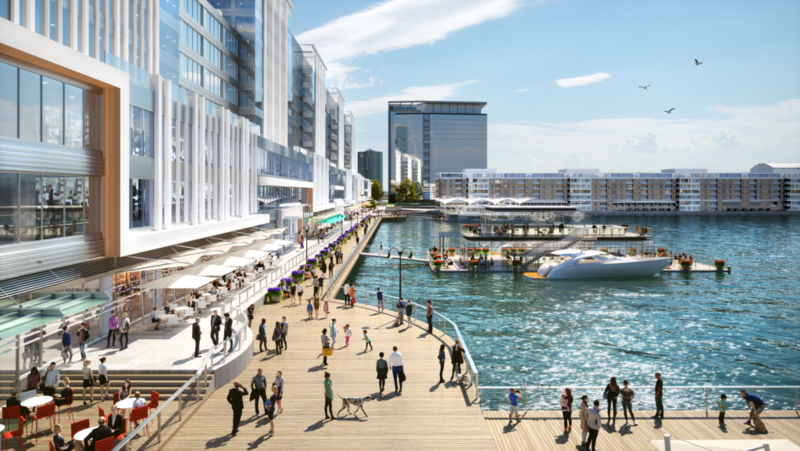 The new renderings depict a row of modern buildings with floor-to-ceiling glass windows, restaurants with outdoor seating and a bustling pedestrian promenade along the river. 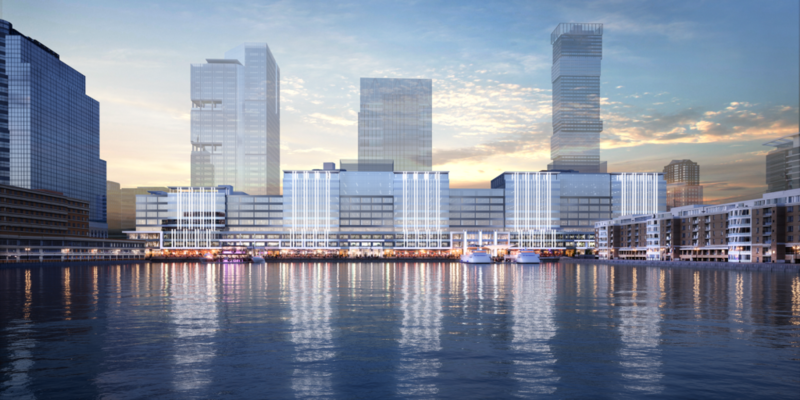 Mack-Cali said its plans call for reskinning the east side of the eight-story Harborside 1 building and the first three floors of Harborside 2 and 3, with an eye toward increasing natural light and views of the Hudson River and New York City. All renderings courtesy of Mack-Cali Realty Corp. and Elkus Manfredi Architects. 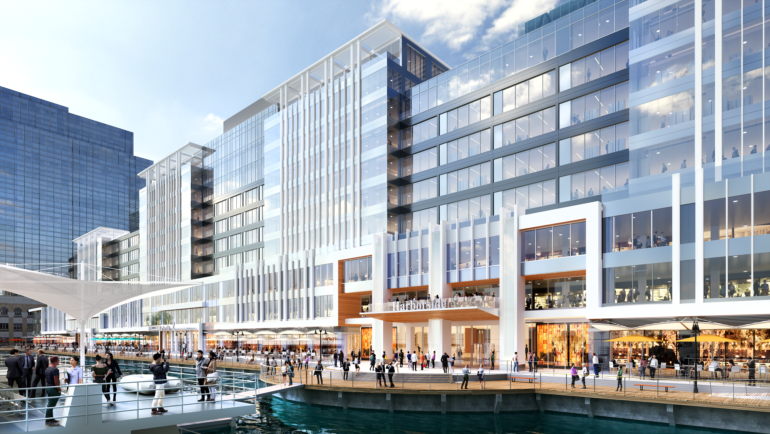 The REIT has already kicked off the project with its reuse of the vast atrium between Harborside 2 and 3, which now doubles as a cultural space that hosts music, dance, art performances and ‘foodie’ events such as food and wine shows. The company also debuted an outdoor beer garden at the complex earlier this year, with plans to open a new restaurant known as Piggyback Bar at Harborside later this month. As part of the interior renovations, Mack-Cali is also revamping the lobbies and adjoining internal passageways to the Harborside atrium to create pedestrian routes. The design calls for hallways and built-in lounge areas to be refinished with a raw, industrial aesthetic that pays homage to Harborside’s industrial past, including dark metal finishes that directly reference the railroads and detailed wood planks that reference the shipping piers. Overhauling the current food court into a grand European-style food hall known as The Marketplace. Kiosks will be leased to a rotating roster of local vendors, with an eye toward making the public space a day-and-night dining destination that constantly offers fresh options. New dining tables and chairs will be installed on the waterfront esplanade. Installing new interior design features that reflect the themes of openness and efficiency with the creation of collaborative meeting spaces featuring modular, modern furniture suited for meetings or independent work, but comfortable enough for rest and relaxation. Earlier this year, Mack-Cali announced its plans to develop a new 1.2 million-square-foot, build-to-suit office tower at Harborside in partnership with SJP adjacent to its existing Harborside buildings. The plans for the overall complex are more than two years in the works, following a leadership change at the commercial real estate giant and a new strategic plan to streamline its vast holdings in the region. 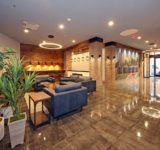 In addition to focusing on office submarkets such as the Hudson waterfront, Short Hills and Metropark, Mack-Cali has ramped up its efforts in the multifamily sector. Through its Roseland Residential Trust subsidiary, the company earlier this year had a pipeline that included nearly 2,700 units.